The recent re-opening of Cook’s Bridge on Central Avenue – and the traffic headaches while it was closed – has us thinking about the importance of our local bridges. Cook’s Bridge, the oldest of them, was first built in 1720 on land belonging to Captain Robert Cook. The current structure, recently reconstructed, dates to 1857, and is the last bridge built by the noted stonemason, Nathan Crafts. Crafts was, sadly, killed in an accident on the bridge during its construction. The bridge stands (more than 150 years later!) as a monument to his work, and a remembrance of the time when stonework was the province of skilled masons, before the Civil War and the rise of professional civil engineering. Crafts built several bridges in the area; it is thought that Fisher’s Bridge (Central Avenue to Dover) is also an example of his work. If it seems to you that the Charles River is everywhere you go in Needham, you’d be right. Needham is in a loop, and nearly every exit from town requires you to cross a bridge. In fact, unless you are going to Wellesley via Great Plain Avenue, it is relatively difficult to leave Needham without crossing water. And it was worse when we still owned Wellesley. There are now nine bridges out of Needham (there were once eleven, when Wellesley was still the West Parish). Two are named after the roads that run over them; the rest are named for the families that once owned the land (and who were often responsible for the upkeep of the bridge). The dates below establish when the bridge was first recorded, though in some cases (Newell’s Bridge, Fisher’s Bridge, and Day’s Bridge) they were in place long before their first mention in the town records. Most started as wooden foot bridges, which were then rebuilt as stone bridges in the 19th century. Can you name them all? But wait! – there’s one more. The one of the earliest crossings into Needham does not have a name. In fact, until it was recently expanded, you probably never even noticed it. The southeastern end of Great Plain Avenue crosses into Dedham without even a “Welcome to ” sign. The road runs alongside a still and peaceful stretch of the Charles. The town line is formed by an ancient canal, known once as the Great (or Long) Ditch, dug in the 17th century to help drain the Broad Meadows. The Ditch runs under the road, meeting the river just under the bridge; it then flows away to the north, rejoining the Charles in West Roxbury, near Millennium Park. (All that marshy stuff you see from the train between Hersey and WRox stations is the Broad Meadows). 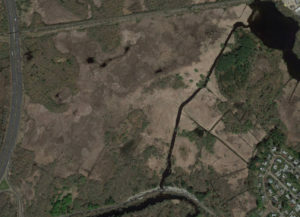 If you look at an aerial map, you will see that the Meadows is crossed by numerous ditches, all part of a drainage system hand-dug in the 1600s. But I digress, as usual. The Great Ditch system (dug in the 1640s). Click to enlarge.